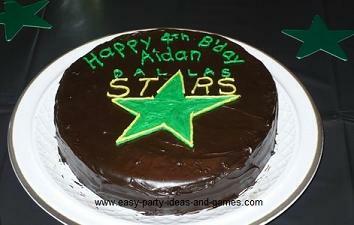 These great hockey cake ideas will be the hit of any hockey fan's celebration! Use these cakes for a hockey fan, or as part of a sports theme party or winter Olympics party. This great cake could be used for any hockey team (or any sports team, for that matter!) Just add the logo of your favorite team and viola! You have it! Everyone loves cupcakes, and these work great for a sports team party! Find a pennant or flag for your favorite team. 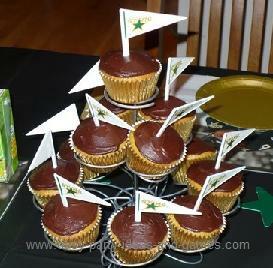 These cupcakes were made to match the Dallas Stars cake above. A rectangular sheet cake has been transformed to a hockey ice rink! Look for supplies to decorate the cake at your bakery supply store, or if your child has hockey figurines, raid their toy supply! 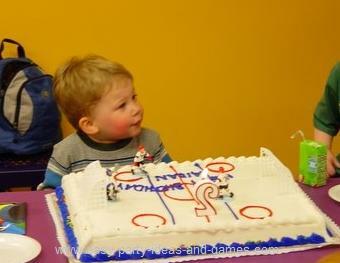 This cute cake of an ice rink includes the zamboni! Show us your great cake and tell us how you did it! I hope you have lots of photos to add1 Just click the button and find it on your computer. Then select it.